Dr. Denson Paul Pollard (University of Iowa Alumni! 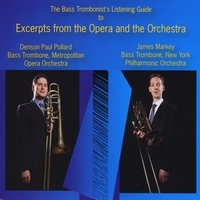 ), Principal Bass Trombone of the Metropolitan Opera Orchestra, and James Markey, Principal Bass Trombone of the New York Philharmonic, have collaborated on a new opera and orchestral excerpts 2-CD set. The set is available from Hickeys.com (Item #85511) and from CDBaby.com. No digital download is available at the time of this post.